Writing a great toast requires creativity, patience, some hard work, and a little ingenuity. With these helpful tips, you'll be able to write a great best man speech in no time. Start off by writing down thoughts freely about the bride and groom and your relationship with them. If you are married, you may wish to think about marriage advice you've received or learned. Are there any particularly amusing anecdotes that illustrate who the groom is? Read through samples of classic wedding toasts and highlight any that seem particularly appropriate to you. Once you've done that, it's time to craft those ideas into a heartfelt and entertaining toast. Start off by introducing yourself, as not everyone in the room will know who you are. You might say "Excuse me, everyone, if I could have your attention. I'd like to take a few moments to say a few words about our bride and groom. I'm John, Patrick's best man, and longtime good friend." To get people's attention, you might say a quick joke or a quote about marriage. Before you get too far into your speech, you should thank the host and say something like, "We're all delighted to be here today on this joyous occasion." This is where the notes you wrote down before will really come in handy. 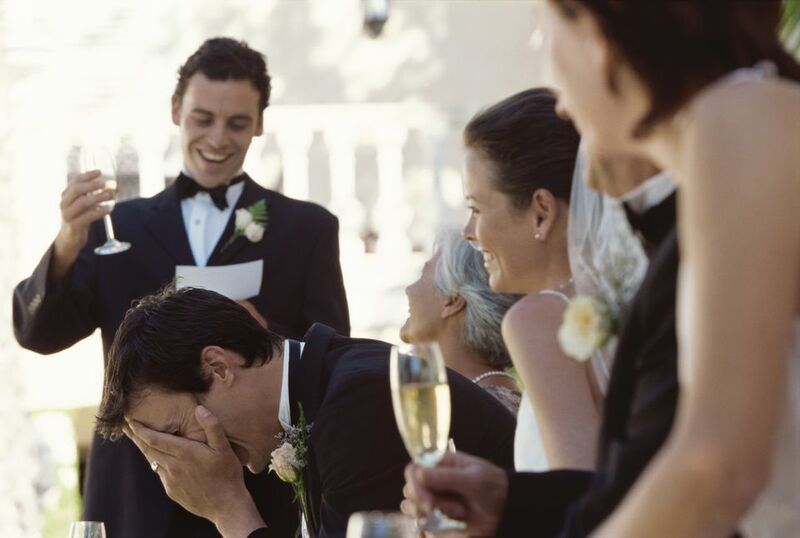 Tell a funny story about the bride and/or groom (that's funny, not humiliating! ), give your thoughts on love and marriage, tell the story of how they met or talk about how you've seen them grow throughout their relationship. While you may know the groom better, try to make your toast balanced by speaking about each of them. Try not to talk too long as nobody wants to hear you ramble, but do give some interesting details. At all costs, avoid ex-girlfriend stories and keep it rated PG for kids and grandmothers in the room. If you are sincere about what you are saying and your words come from the heart, it's hard to go wrong. It's often good to wrap up your toast with a wish, a toast or a blessing for the couple. Raise your glass with resounding congratulations, cheers, l'chaim or salud, and don't forget to drink to your own toast! Write your toast down on a notecard or on your phone and practice it a few times beforehand so you don't sound like you're reciting it without a personality. You may also wish to run your toast by a trusted friend who can give you some feedback. Then it's time to relax, enjoy the wedding, and support your friends. Speak loudly and clearly, even if you're nervous. Hopefully, you'll have a microphone. Even if you don't, make sure to enunciate. There's nothing worse than listening to five minutes of mumbling nonsense. Don't drink too much before you give your speech. A drink or two might help loosen you up, but more than that and you'll look like a fool. Don't read straight from the card. These are supposed to be heartfelt words, not a scripted, robotic response. It's better to paraphrase what you've written to get a general sentiment across. Of course, you can have your notes handy, just remember to make eye contact with the room. Stand up straight. This moment is an important one, and your posture should reflect that. Plus, you want to look good in those wedding photos, right? If you lose your notes or just choke up there, there's nothing wrong with a simple "Congratulations [bride's and groom's names], I'm looking forward to the day when we're all together again celebrating your 50th wedding anniversary. Cheers!"